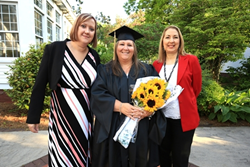 Graduate Turrah Benton met her enrollment and success coaches for the first time in person during Brenau University's graduation festivities. “My coaches at Brenau kept me going,” said Benton. “When life got overwhelming and I wanted to stop, my coaches pushed me through it, even if it meant talking on the phone for more than an hour. I could not have done it without them." As the retention crisis continues in higher education, Brenau University is maximizing persistence by equipping enrollment and success coaches with the data insights and actionable intelligence they need to provide personalized and effective student support. This data-driven approach to student retention is enabling Brenau University to project a five percent year-over-year retention rate lift for its post-traditional students in 2016. “Nearly half of students who pursue a college education leave before earning a degree, according to the National Center for Education Statistics. At Brenau, we believe we have a responsibility to push harder for our students, and assist them not only in their academic lives, but in their personal lives as well,” said Nancy Krippel, Provost and Vice President for Academic Affairs at Brenau University. Across the student lifecycle Brenau University leverages Helix’s closed-loop technologies, which include Helix Retain – a proprietary retention CRM that leverages enrollment, academic and behavioral data to inform and automate personalized student engagement plans – as well Helix’s success coaches. Brenau University has been named one of the best universities in the Southeast by the Princeton Review and ranked nationally by several organizations for its online degree programs. The university held its annual spring commencement last weekend. The class of 2016 included Turrah Benton, a post-traditional online learner graduating from the Ed.S. program. Benton is a full-time fourth grade teacher and mother of three who relied on her enrollment and success coaches to mentor and motivate her throughout her studies. Benton met her coaches for the first time during the graduation festivities. Karen Osterberg, the enrollment coach who was Benton's initial point of contact at Brenau, guided her throughout the application and enrollment process, while assessing her inspirations, goals and other life commitments outside her degree program. "Because of the information Turrah shared during the admissions process, coupled with the ongoing student data we leverage to create predictive models, I had a clear understanding of her goals, motivations and potential roadblocks and could provide her the personalized support she needed. Together we were able to set her up for success from the beginning. I'm so proud of what Turrah has accomplished." "What higher education has always done isn’t working anymore. Institutions need to change their approach to student retention. While technology on its own isn't enough to boost retention, the combination of predictive intelligence and proactive coaching can absolutely retain more students," said Sarah Horn, Vice President of Retention Services at Helix Education. "Brenau’s projected five percent lift in retention this year is a testament to their commitment to student success. On behalf of Helix Education, we congratulate Brenau and Turrah on these fantastic milestones." Helix Education provides colleges and universities a comprehensive suite of technology and services to power data-driven enrollment growth 8x faster than the industry average. The company’s three solutions — Outsourced Program Management, Enrollment Marketing and Retention Services — have successfully helped institutions find, enroll, retain, teach and graduate post-traditional learners for more than 30 years. Its enrollment growth solutions are powered by a proprietary technology ecosystem that aggregates data across the student lifecycle to better understand an institution’s best-fit students’ journey, and implements actionable intelligence to improve outcomes for students and institutions alike. For more information, visit http://www.helixeducation.com. The class of 2016 included Turrah Benton, a post-traditional online learner who is also a full-time fourth grade teacher and mother of three.